Over the past 30 years, as world music has emerged as a commercial music category, the general audience interest in it has continued to grow and morph. As a meta-genre, it has long jumped the boundaries of its component musics’ roots in their ethnic communities of origin. The various kinds of music included in the sea of world music, when observed at close hand, really consist of multiple interconnected pools. And here in Toronto there are many such pools teeming with life. This is the “scene” I try to get a feel for and share with you, dear reader, in each WholeNote issue. As important as various groups and communities are to the overall vibrancy of the local world music scene, the significance of the contributions of certain individuals pops out occasionally. These individuals are the performers, teachers, producers and programmers without whose imagination, skill and dedication the scene would be a very still pool indeed. Small World Music is a case in point. This production company is the lovechild of Alan Davis who cut his programming teeth at Toronto’s Music Gallery in the 1980s and 1990s. In the ten years since he founded his production company, Small World Music has become, arguably, Toronto’s most active and consistent presenter of music from many corners of the globe. It is also a supporter of music that mixes all sorts of genres. I attended the launch of the tenth annual Small World Music Festival on September 22, and got the scoop on this year’s lineup. Having begun in September, the Small World Music Festival continues on October 2 at the Enwave Theatre, Harbourfront, with the Karevan Ensemble performing a concert titled “Homeland Variations.” Composed by Reza Moghaddas, the score received a 2011 Dora Mavor Moore Award nomination. Called “multimedia Persian fusion,” the music combines gypsy songs accompanied by kamancheh (Persian fiddle), punctuated by saxophone, keyboards and electric bass. Further sections feature R&B rhythms blended with industrial and electronic sounds, dovetailing with melancholy duduk (Armenian reed) melodies and the spirited upbeat juxtaposition of African percussion, kamancheh and tanbour (Kurdish lute). I’m guessing the dancer Bahareh Yaraghi will provide the “multimedia” aspect of the show. The same Sunday night at the Royal Conservatory, Small World Music, in association with the RC, presents the Bollywood diva Asha Bhosle with Nilandri Kumar on sitar. Bhosle, one of the queens of playback singing, has performed an astounding 20,000+ songs in over 1,000 movies in her epic career. In fact she has the distinction of receiving the “most recorded artist” laurel from the Academy of World Records. Kumar, much the junior of Bhosle in age and experience, is an emerging Indian fusion sitarist with roots in the classical tradition. He has worked in Bollywood as a musician, and recorded with guitarist John McLaughlin on his album Floating Point, as well as on 13 of his own albums. We can expect that popular film songs and ghazals, songs sometimes included among the “light classical” side of North Indian music, will dominate the evening at Koerner Hall. Another example of an individual who has made a significant contribution to Toronto’s world music scene is the mrdangam (South Indian hand drum) master and music professor Trichy Sankaran. It is hard to recall a time when Indian music–classical and otherwise–was not a feature of Toronto’s concert and university music education landscape, but there actually was such a time not that long ago. A noted mrdangam player in India when still quite young, Sankaran came to York University 40 years ago to help build its newly hatched South Indian classical music (Karnatak music) programme. He’s still teaching at York, inspiring by example yet another generation of students to study this highly developed percussion art form. He has also inspired some of his two generations of students, myself included, to infuse Karnatak music’s language and discipline into their own music and scholarly research. Sankaran’s 40th anniversary at York will be marked on October 4, 7:30pm, at a concert at the Tribute Communities Recital Hall, part of the York University Department of Music’s “Faculty Concert Series.” In addition to Sankaran’s brilliant mrdangam playing, guest musicians will include members of Autorickshaw (Suba Sankaran, piano and vocals; Ed Hanley, tabla; and Dylan Bell, bass guitar), as well as Mohan Kumar, ghatam, and Desi Narayanan, kanjira. Trichy Sankaran’s considerable contributions to his field are increasingly being acknowledged. He has recently been short listed for the Toronto Arts Foundation’s Muriel Sherrin Award for International Achievement in Music. He will be receiving the prestigious “Sangita Kalanidhi” title from the Music Academy in Chennai, India, in January 2012. A commemoration of another sort takes place on October 21 and 22 at the Betty Oliphant Theatre. The works of the late Toronto composer and percussionist Ahmed Hassan were imbued with Afro-Caribbean and Middle Eastern influences. Written primarily in conjunction with Canadian theatrical dance, Hassan’s works will receive performances in their original staged dance context at the Abilities Arts Festival, produced by Peggy Baker Dance Projects. Renowned dancer Peggy Baker, the curator of this show, is Ahmed Hassan’s widow. Titled “The Neat Strange Music of Ahmed Hassan,” his music will be performed along with the original dances, by important Toronto choreographers, for which his music was commissioned. The performers include senior students of the School of Toronto Dance Theatre; Hassan’s sister, Maryem Tollar, vocals and Mother Tongue, a “world beat” band. World music also makes several appearances this month further downtown on Front Street at the splashy, renovated Sony Centre For The Performing Arts. On October 21 “Goran Bregovic And His Wedding and Funeral Orchestra” features music from the mixed ethnic centre of Sarajevo, combining a Serbian gypsy band, a classical string ensemble, an Orthodox male choir and two Bulgarian female vocalists. On the 22nd, the Salsa Kings perform music from Cuba including the dance-infused music of the mambo, rumba and the cha cha cha. Bharati’s storyline, on the other hand, sounds compellingly contemporary. A modern day Siddharth raised in the U.S. and cynical of all things Indian returns home to cleanse the Ganges river of its pollution. Despite his contempt, Siddharth is attracted to a mysterious and elusive Indian woman, Bharati, who reintroduces him to the many wonders of India. As the story goes, in the end, Siddharth, appearing to be a sort of diasporic Everyman, discovers a new sense of self in this journey of homecoming, identity and redemptive love. These are big, ambitious themes. I hope the production delivers them with more than simplistic bombast since I plan to attend. I especially wish for a nuanced presentation of a sampling of the multitude of Indian traditional performing arts, among the treasures of the music of our world. September has come around again, yet many of us are eager to squeeze as much summer as possible out of this swing season month. While the fall concert season in the past has typically begun this month, in recent years it seems the lines between summer and fall seasons are becoming less defined. The majority of the concerts take place in August but I found a few this month, which are of interest to world music aficionados. On Saturday, September 3 at 6:30pm “Hawaiian Pacific Magic,” a music and dance troupe, will take you on a tour of Polynesian culture. Their repertoire includes the Hawaiian hula along with its ancient chants, the magic poi dances of New Zealand and the drum-driven performance arts of Tahiti (the otea), Fiji and Samoa. I’ve experienced some of these performances on their home turf and when done with skill and passion they leave tacky Hollywood and TV stereotypes in the sand. There has long been a special place in my heart for this music and dance — a longing that only the island spirit of aloha can fill. Sadly it’s a balm much too rare in our town, and I’ll be sure to dip into it on this occasion. On Sunday September 4 at 3pm, Bryant and Faye Lopez appear as “Tango Soul” on the Transat Holidays International Stage. They will be dancing the Argentine tango to the virtuosic and emotive music which bonds so completely with this archetypal couple dance that it’s impossible to determine which accompanies which. Tango is a thrill to watch, only exceeded by the thrill experienced by those performing. Frank disclosure: I fall into the former armchair category. If I were in town on the first weekend of September and got a hankering for Latin culture, I’d visit the “Hispanic Fiesta,” now in its 30th year, at North York’s Mel Lastman Square. The Fiesta features the music, dance and food of 20 different Spanish-speaking countries, and boasts over 300 local and international performers. Over the years the Fiesta has quietly garnered a reputation as one of the best-organized ethnic festivals in Toronto. Hafez Nazeri, among Iran’s younger generation of composers, is currently based in Toronto. His “Rumi Symphony Project,” based on the poetry of the famous Persian Sufi bard, is marking its Canadian debut at the Sony Centre for the Performing Arts on September 10. The project has received glowing reviews from leading American dailies. Hafez Nazeri will perform alongside an international ensemble of musicians including his father, the noted vocalist Shahram Nazeri. 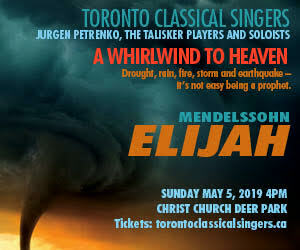 The concert will also feature the world premiere of new compositions pairing the classical music of Iran and the West, from his upcoming album on Sony Classical. The composer aims to create a new genre that unifies these two distinct cultures and their musics. Later on in the month, on September 27, a new music project called “Andalusia to Toronto” launches at the Royal Conservatory’s Koerner Hall. This concert, presented in partnership with Small World Music, mixes traditional and jazz-accented Arabic, Jewish and Afro-Cuban music, each of which celebrates roots on the Iberian Peninsula. Some of Toronto’s leading exponents of these genres are involved including David Buchbinder, trumpet and flugelhorn; Bassam Bishara, vocals and oud; Michal Cohen, vocals; Amanda Martinez, vocals; Hilario Durán, piano; Aleksandar Gajic, violin; Roberto Occhipinti, double bass; Jamie Haddad, percussion; and Roula Said, dance and voice. My bet is that this outstanding group of musicians will take their audience on a thought-provoking and exhilarating multi-cultural musical excursion. I plan to be there. It will be a fine way to mentally prepare for the crisp fall weather coming all too soon. Our annual, semi-tropical season has finally arrived in Southern Ontario. As well as officially launching the BBQ, road construction and vacation seasons, it also signals a mean average increase in world music concerts. The clement weather affords all of us the opportunity to enjoy music from various corners of the world performed alfresco, as well as making it easier to travel to outdoor festivals across the province. I’ll be taking advantage of both the good weather and travel opportunities to perform out of town. One gig I look forward to is at the Electric Eclectics (EE) festival, now in its sixth year. My musical partner, guitar and kacapi (zither) player Bill Parsons, and I (on suling) are collectively known as Sunda Duo. We will be performing at the EE’s DJ Tent on Saturday, July 30, 2pm. EE is easily among Ontario’s most unusual summer festivals. In addition to having an eclectic programme, its site — a farm overlooking the scenic Beaver Valley, just outside of Meaford, Ontario — is a major draw. While EE focuses on avant-garde and crossover musicians, art installations, DJs and films, this year it is embracing Sunda Duo’s world music-meets-Toronto-eclectic fusion. Expect to hear West Javanese (Indonesia) songs combined with our compositions, creating a special Asian-inflected blend of contemporary Canadian music. Given that the majority of the audience camps out on the EE farm, I’m preparing to enjoy that age-old Ontario summer custom too. The TD Sunfest in London, Ontario, is among our longest running world music-friendly festivals. Running from July 7–July 10 at the relaxed and verdant Victoria Park in the centre of the city, the concert lineup on the evening of July 7 looks particularly international: Tram des Balkans (France); Mamaku Project (New Zealand); Etran Finatawa (Niger); Novalima (Peru); and Dizu Plaatjies and Ibuyambo (South Africa). On July 10 at 4pm, Hindustani classical music reigns at the Living Arts Centre in Mississauga. Headlining are the vocalist Pandit Ajoy Chakrabarty, and the emerging young master sarod-ist Alam Khan. He is the son of the late, great sarod maestro Ali Akbar Khan. The Huntsville Festival of the Arts is also venturing into world musical territory. Arvel Bird performs on Native American flute and fiddle on July 2; Luis Mario Ochoa Cuban Quintet appears on July 28; and the Jesse Cook group plays guitar-centric music with global influences on August 18. Of course there’s no need to get out of town to hear world music this summer. There is plenty of it right in Toronto. Among the granddaddies of summer programming is the Harbourfront Centre’s series, this year tilted “Hot Spot Summer.” Each weekend’s festivities are keyed to a different concept or national theme. During the first weekend, on July 2 at 9:30pm, Systema Solar performs their hot Afro-Caribbean and Colombian music on the Redpath Stage. The next day, on the same stage, at 5pm, Moana & the Tribe redefines inter-island music with an idiosyncratic mix of reggae, funk and Maori music. The cultures of Mexico, Colombia and Iran are featured July 8–10, July 15–17 and July 21–24, respectively. “Island Soul Festival” showcases carnival, pan (steel drums ensemble), poetry and dance July 29–August 1. One of the more intriguingly named three-day festivals is “What is Classical?” running August 5–7. I’m curious how the curators will explore the diverse forms of ‘classical’ music from the Americas, the Middle East and East Asia. August 19–21, South Asia’s turn comes with “Masala! Mendi! Masti!” Harbourfront audiences can explore Taiwan’s emergence as a source for both new and old artistic expressions August 26–28. The annual summer series at the lakeshore Toronto Music Garden is celebrating 12 years of free concerts in its lush urban-themed garden setting. All this time it has been serving up a high level of performances of classical and traditional music from around the world. I’ve performed there several times. Despite the noisy proximity of the island airport, Front Street traffic and the Gardner, is there a better free, open-air-blanket-on-grass concert experience downtown? All that’s missing is the B&B: barbeque and beverages. This summer I look forward to the visit of several outstanding groups to the Music Garden. Vancouver’s Juno-nominated Orchid Ensemble plays repertoire inspired by mountains and rivers on Thursday, August 18, at 7pm. The Shiraz Ensemble on Sunday, August 21 at 4pm, makes an eloquent and elegant case for Persian classical music, exploring the roots of melodic modes and rhythms in its music and sophisticated poetry. Toronto’s own muscular taiko (Japanese drum) ensemble Nagata Shachu will undoubtedly raise summer temperatures even higher with its appearance on Thursday, August 25, at 7pm. Elsewhere in Toronto, Megobrebi: World Vocal Ensemble sings at Music Mondays’ 12:15, July 4 concert at the Church of the Holy Trinity. On July 9, the controversial Iranian musician, singer-songwriter Moshen Namjoo and his group, perform Persian music fused with western styles at the George Weston Recital Hall, presented by the Parya Trillium Foundation. Also at the Weston Recital Hall, Toronto lovers of Cantonese opera can get their all too rare fix on July 10 at 2pm, when the Starlight Cantonese Opera performs. There are other festivals this summer, both grand and intimate, with world music programmes. Intrepid musical explorers may wish to check offerings at the Mill-Race Folk Festival, Collingwood Music Festival, Elora Festival, Savannah Festival of Rhythms, Ottawa Chamberfest and others. I wish you pleasant musical trails and discoveries. June appears to be another month chock-ablock with performances of both seasoned world music headliners and fresh experimenters. On June 3 the Carnatic violin virtuoso L. Subramaniam performs with his son Ambi Subramaniam at the Isabel Bader Theatre. No stranger to international audiences, L. Subramaniam comes from a leading south Indian violin playing family. In his long and well-recorded career he has garnered glowing testimonials from Indian and Western notables. Fellow fiddler Yehudi Menuhin once pronounced, “I find nothing more inspiring than the music making of my colleague Subramaniam.” Dubbed “The Paganini of Indian Classical music,” L. Subramaniam draws his musical language from both Karnatak and Western classical sources in his concerts and in his over 150 recordings and feature film soundtracks. Several percussionists and a morsing (mouth harp) player will accompany the Subramaniams’ brilliant flights of melody. At the other end of the spectrum of world music, the experimental quartet Global Cities Ensemble performs at the Music Gallery on June 5. This recently formed Toronto quartet’s intercultural experimental mission infuses hip-hop with West Asian & South East Asian instruments and music, thereby exploring a new world music language. Four respected musicians on the Toronto music scene, each from a different musical background, comprise the GCE collective. Members include the award-winning Toronto rapper and songwriter Abdominal; the leading experimental turntablist and electronics musician Professor Fingers; the Toronto virtuoso of the tar (long-necked Persian lute) Araz Salek, and yours truly on suling (Indonesian bamboo ring flute) and kacapi (Sundanese zither). With such a mix, expect an adventurous exploration of a new global sonic landscape. Luminato 2011 is billed as “Toronto’s 10 day festival of arts and creativity.” This year it boasts a veritable world music festival featuring a large number of impressive world music acts at its new downtown festival hub at David Pecaut Square, and elsewhere. Commissioned by Luminato, Sampradaya Dance Creations premieres its production TAJ on Friday, June 10 at the Harbourfront Centre’s Fleck Dance Theatre. Under the artistic direction of the award-winning company choreographer and dancer Lata Pada, this 90-minute dance drama has a music score by Praveen Rao. Bollywood stars Kabir Bedi and Lisa Ray headline the production that chronicles the human drama behind the Taj Mahal, the Indian architectural wonder. This is among the most ambitious productions of the Mississauga based Sampradaya Dance Creations which boasts a 20 year history marked with innovative dance creations, many featuring music commissions as an essential performance element. The Luminato world music series launches at the David Pecaut Square on the evening of June 11 with the Italian group Bandabardò. Formed in 1993, this Florentine folk revival band is renowned both for its live performances and for its popular albums. Bandabardò is joined by the singer/songwriter Peppe Voltarell whose Calabrian roots lends authority to his signature blend of rock with the folk music of Southern Italy. Toronto’s Dominic Mancuso, the winner of the 2010 Juno for World Music Album opens the evening. Mancuso who has been called the “premier Sicilian griot of these times” sings an emotionally fuelled blend of Italian folk, influenced by blues, soul, and jazz. On Sunday June 12 at 2pm Homayun Sakhi, widely considered the finest Afghani rubâb player of his generation performs at Luminato. The remarkable Alim Qasimov Ensemble from Azerbaijan who follows Sakhi has been acclaimed by the Guardian as “one of the most thrilling, unashamedly emotional performers on the planet.” Alim Qasimov is the world’s leading exponent of mugham, a sophisticated Azerbaijani performing art form combining music with classical poetry. Musician friends who play Arabic and Persian music have already made plans to attend this extraordinary double bill concert. That same evening (June 12) the renowned Kronos Quartet headlines an evening of string music – with an idiosyncratic world music twist. The Grammy-winning American Kronos has been active for decades developing a unique repertoire mixing classical string quartet works and global musical languages in one adventurous combination after another. The resulting thousands of concerts and dozens of albums are an eloquent testament to the success of their approach, attempting no less than a redefinition of the string quartet’s role in music today. Their guest is Toronto’s Annex Quartet. They will jointly perform a typically eclectic all-contemporary programme including Terry Riley’s Sunrise of the Planetary Dream Collector, David Balakrishnan’s Skylife, Franghiz Ali-Zadeh’s Mugam Sayagi, and Osvaldo Golijov’s Se Me Hizo Facil. Toronto’s Sultans of String perform at Luminato with Yemen Blues on June 14. The local group garnered a 2010 Juno nomination for their infectious dance music mixing French Manouche Gypsy Jazz, Spanish Flamenco, Middle Eastern Folk, and throwing in Cuban Rhythms for good measure. Yemen Blues (USA/Israel) on the other hand draws on founder Ravid Kahalani’s roots to define his original compositions. His nine-member group blends Yemenite songs with blues, jazz, and funk in a dance friendly fusion of complex grooves. June 16 brings an evening of contemporary bhangra to Luminato. Bhangra is the popular dance music genre originally from rural Punjab. The Vancouver group Delhi 2 Dublin includes Celtic fiddle players, two bhangra percussionists and a female Bollywood-style vocalist, presenting them in an exhilarating mash-up of Punjabi bhangra, Celtic, dub reggae, and electronica. Bhangra superstar Malkit Singh and his band Golden Star follow. They have toured the world and won international acclaim for such hits as “Jind Mahi” from the Bend It Like Beckham film soundtrack. June 19 marks the closing day Luminato festival concert. At 2pm Toronto’s Tasa performs original compositions as well as arrangements of songs from the Indian diaspora. Founded in 1999 by tabla player and composer Ravi Naimpally, Tasa is one of our town’s leading world music ensembles, winning an Urban Music Award for Best World Music Album for their debut release “Bhakti.” The Indo-British musician, producer and composer Nitin Sawhney is the festival’s closing act. His critically acclaimed music combines Asian and other world influences with elements of jazz and electronica. Sawhney has just released the album “Last Days of Meaning,” an unusual theatrical project with deep themes: reflection on the past, shared memory, empathy and ultimately hope. Saturday June 25 the group Wenge Musica Maison Mere directed by Werrason plays at the Ukrainian Cultural Centre. At the beginning of the 1980s, the Congolese singer and musician Werrason was an essential member of the innovative band “Wenge Musica 4X4 Tout Terrain d’Intervention Rapide,” touring throughout Europe, Africa, and North America. Werrason’s 1999 album “Solola Bien” was accorded the Golden Record in France. The following year he performed in Paris in front of 17,000 fans and in years since has released a number of world music albums. Be prepared to dance deep into the night: the show is advertised to last from 9pm to 2am. In closing, a word about music performances at the Toronto Public Libraries. With 99 branches, the Toronto Public Library is the world’s busiest urban public library system. 18 million visitors borrow more than 32 million items each year. While the branches have long been information and education hubs for citizens of all ages, recently it seems that performing arts events including music have been rising to the top of the stacks. During the month of May a spate of performances celebrated Asian Heritage Month with eight Asian Homelands Festival programs around town. On June 8 at 2:00pm at the Elizabeth Beeton Auditorium, Toronto Reference Library, the Native Canadian Centre of Toronto presents Native Songs and Dance: The Importance of First Nations Culture, a programme of singing, dancing and drumming to be followed by discussion. Free programs celebrating Portuguese and Newfoundland musical connections are scheduled at 2pm at the Northern District Public Library at 40 Orchard View Blvd. On June 2 John Christopher and John Showman play Newfoundland, Latin and bluegrass music on guitar and violin. Mark and Ken Sparling perform on banjo and guitar on June 16. Finally, local Portuguese guitar masters Nuno Cristo and Alvaro Oyarce play the music of their homeland on June 23. Andrew Timar is a Toronto musician and music writer. He can be reached at worldmusic@thewholenote.com.